More than half the number of female employees working at the Justice Ministry and the prosecution experienced sexual harassment and/or assault by other employees, and most of the incidents were kept secret, a special ministry panel revealed Thursday. In a press meeting, the independent panel looking into sexual crime at judicial bodies reported that 61.6 percent of 7,407 female workers, including prosecutors and ministry officials, responded that they had experienced sexual harassment and/or assault by other employees. The survey was conducted on 8,194 female employees at the prosecution, Ministry of Justice and affiliated judicial entities from March 26 to April 6. The response rate was 90.1 percent. The committee also said that despite the high rate of occurrences, only three sexual harassment cases had been referred to the internal deliberation board, while 18 cases were handled by the Justice Ministry from 2011 to 2017. 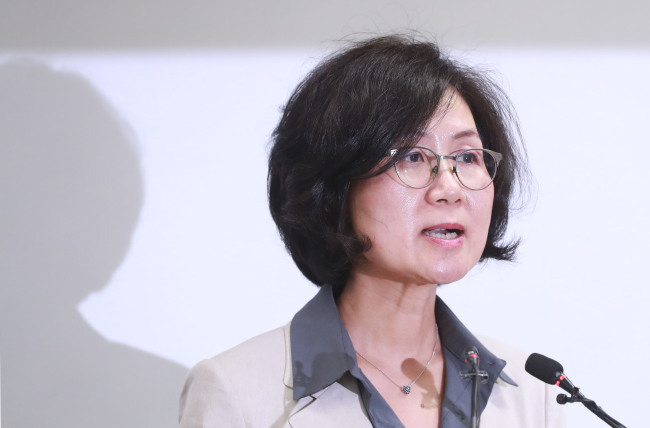 Announcing the results of the survey, the head of the special committee Kwon In-sook said it has delivered the report to the justice minister, and demanded the ministry and prosecution establish a new, comprehensive counseling system to investigate reported cases and protect victims. Seo is a female prosecutor who disclosed sexual misconduct by a senior Justice Ministry official in a televised interview in late January, sparking the nationwide #MeToo movement. The ministry’s special panel was created in February to come up with measures to prevent sexual crimes within judicial bodies after Seo’s interview aired. While many of the sexual misconduct cases reported by the survey were verbal and visual harassment, an “unexpectedly” high rate of 22.1 percent of the respondents said they experienced abuse involving direct physical contact such as hugging, kissing and inappropriate touching -- which are subject to harsher legal punishments. The survey, which allowed multiple choices, also showed that over 85.7 percent of the abuse cases were committed by more senior employees and 90.9 percent were males. As for the reasons why the victims were not able to raise the issue or file a complaint against abusers, 70.9 percent said it was due to the environment in which victims are often blamed and faulted. The fear of being seen as unfit for the job if they raised the issue was the reason 68.3 percent of the respondents gave for not speaking up, while 66.7 percent answered they had not seen strict punishments in such cases. Sixty-eight percent of the employees also did not know that there was a counseling center for sexual misconduct at work. “Overall, the low number of reports shows that the employees do not trust the judicial bodies to properly investigate their cases,” Kwon said. Ending the panel’s first three-month investigation session, Kwon said the panel would focus on coming up with detailed measures aimed at preventing and dealing with sexual misconduct cases in the next session.